Dad and Son Clemson Fans Catchin’ Fish! Mark and Marcus were some fun Clemson fans to fish with today!! Posted in Fishing Charter Pictures	| Comments Off on Dad and Son Clemson Fans Catchin’ Fish! Took the Family Fishing on St Joe Bay!! Took my daughter and son out today for some trout fishing! Why is Taylor the queen of big trout?!! 27 inches!!! Posted in Fishing Charter Pictures	| Comments Off on Took the Family Fishing on St Joe Bay!! Muddy Water Redfish at Indian Pass! Patrick and Scott showing off a few of the reds we caught today!! The wind was terrible and muddied the water up bad but we managed 14 redfish today! Posted in Fishing Charter Pictures, Fishing Charter Recent Posts	| Comments Off on Muddy Water Redfish at Indian Pass! Late Season Triple Tail at Indian Pass! Ron and Eric were back for one last shot at these triple tail before they migrate south from Indian Pass!! Posted in Fishing Charter Pictures	| Comments Off on Late Season Triple Tail at Indian Pass! Teenage Girls and Dad Catching Redfish! Very enjoyable morning catching redfish with this nice Georgia family!! The teen age girls did awesome!! Dad wasn’t bad either, haha!! Posted in Fishing Charter Pictures	| Comments Off on Teenage Girls and Dad Catching Redfish! Chris had never caught a redfish and the first fish of the day was this beauty!!! Posted in Fishing Charter Pictures	| Comments Off on Chris’s First Ever Redfish! First Ever Redfish for Young Zach! Another slam today with some big trout, redfish and flounder!! 13 year old Zach had his heart set on catching a redfish and his wish came true with the last fish of the day!! Posted in Fishing Charter Pictures	| Comments Off on First Ever Redfish for Young Zach! Limit of Reds and Trout for Joe and Harold! Joe and Harold caught a limit of trout and reds today in some very tough conditions! Posted in Fishing Charter Pictures	| Comments Off on Limit of Reds and Trout for Joe and Harold! Speckled Trout Bite is Picking Up on St Joe Bay! Donny and Alysa had 9 keeper trout, several throwbacks, missed a few big trout and a big red, 2 Spanish and had a great morning!! 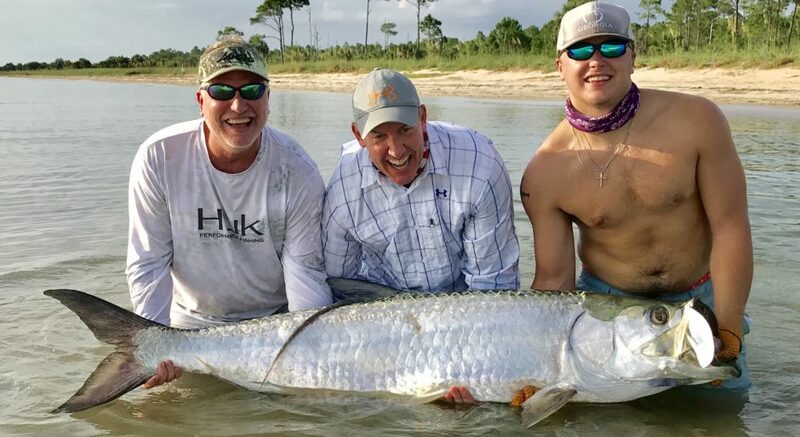 Posted in Fishing Charter Pictures	| Comments Off on Speckled Trout Bite is Picking Up on St Joe Bay! Trip and the Boys get the Inshore Slam!! Speckled Trout, Redfish and Flounder = Inshore Slam on St Joe Bay!!! Posted in Fishing Charter Pictures	| Comments Off on Trip and the Boys get the Inshore Slam! !